Published in Rafu Shimpo, May 25, 1970, Japanese section. 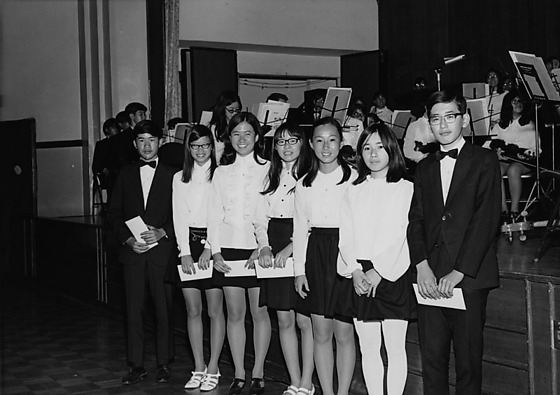 Seven boys and girls of the Japanese Symphony receive fellowships and a solo violinist performs at the Spring family concert held at Koyasan Buddhist Temple in Little Tokyo, Los Angeles, California, May 25, 1970. 2N: Female violinist in long dark dress as conductor and orchestra listen on stage. Typed on original envelope: Japanese Symphony at Koyasan -- 7 People Receiving Scholarships.